In the continuing conflict in Iraq, Kurds frequently are mentioned alongside Iraq’s Sunni and Shia Muslim populations as one of the key groups involved in power struggles for which sharp religious divides have played a major part. But while the Kurds are a crucial part of Iraq’s political makeup, they are an ethnic group, not a distinct religious sect within Islam. Kurds are more appropriately compared to Arabs, the largest ethnic group in Iraq, or other regional ethnic groups such as Assyrians or Turkmen. 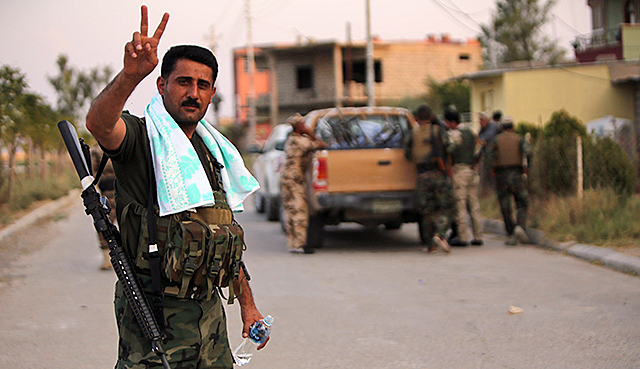 Nearly all Iraqi Kurds consider themselves Sunni Muslims. In our survey, 98% of Kurds in Iraq identified themselves as Sunnis and only 2% identified as Shias. (A small minority of Iraqi Kurds, including Yazidis, are not Muslims.) But being a Kurd does not necessarily mean alignment with a particular religious sect. In neighboring Iran, according to our data, Kurds were split about evenly between Sunnis and Shias. Although recent conflicts in the region may have resulted in population shifts, our survey found that overall, Shia Arabs made up about half of Iraq’s population (49%), Sunni Arabs comprised about a quarter (24%) and Sunni Kurds were a somewhat smaller share (15%). Other Muslims account for about 8% of Iraq’s population. 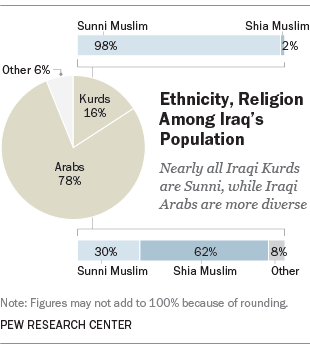 Five percent of Iraq’s population does not identify as Muslim. These three major religious and ethnic groupings in Iraq – Shia Arabs, Sunni Arabs and Sunni Kurds – share certain core religious beliefs. For example, each group professes near universal belief in God (Allah) and the Prophet Muhammad, and more than nine-in-ten members of each group say they fast during the Islamic holy month of Ramadan. Though there are some important distinctions in belief and practice between Sunni and Shia Muslims, the religious differences between Sunni Arabs and Sunni Kurds are comparatively small. For example, while Shia Arabs are united in their belief that visiting the shrines of Muslim saints is acceptable (98%). Fewer Sunni Arabs (71%) and Sunni Kurds (59%) support this practice.